Happy Cupcakes to you today! I have been decorating for upcoming birthdays in our family and wanted to make my own cupcake decorations. I decorate for all the holidays so why not our family birthdays! 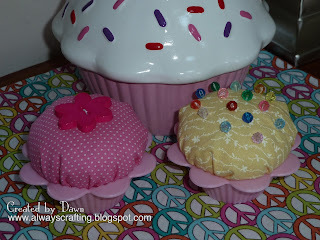 Here is the cupcake I am going to show you how to make. Ok. Now you have your supplies so let's get started!! To start out you need to layout your fabric on a flat surface and place your plate face down on the fabric. Then using a pencil trace around the plate, making a large circle on the fabric. Once you have cut out your circle, you need to rollover the edge then baste stitch it down. When you stitch all the way around the circle you need to leave the threads long so you can draw up the fabric. You need to stuff the circle with fiber fil before you draw up the circle completely and then tie off the threads. Like in the picture below. Once this is completed, turn over your ball of stuffed fabric and sew a fun button or beads to the top of the ball. Lastly, stuff your decorated ball into the silicone cup with the decorated side up. Now you have a cute cupcake to use for decorating for someone's birthday. Check out my blog candy here.